Today, with the release of Core 9.7.0.1, MobileIron officially introduce support for work profiles on fully managed devices. Work profiles on fully managed devices (further referred to as managed work profile) is the fourth and final deployment scenario (far-right, pictured below) for Android Enterprise and the one I’ve been waiting for since its announcement last year! For those unfamiliar, managed work profile is the equivalent of COPE – Corporate Owned, Personally Enabled – which has also gone by the name of COMP (Corporate Owned Managed Profile), WMWP (Work-Managed Work Profile) and likely other names/acronyms as well. Image from What is Android Enterprise and why is it used? 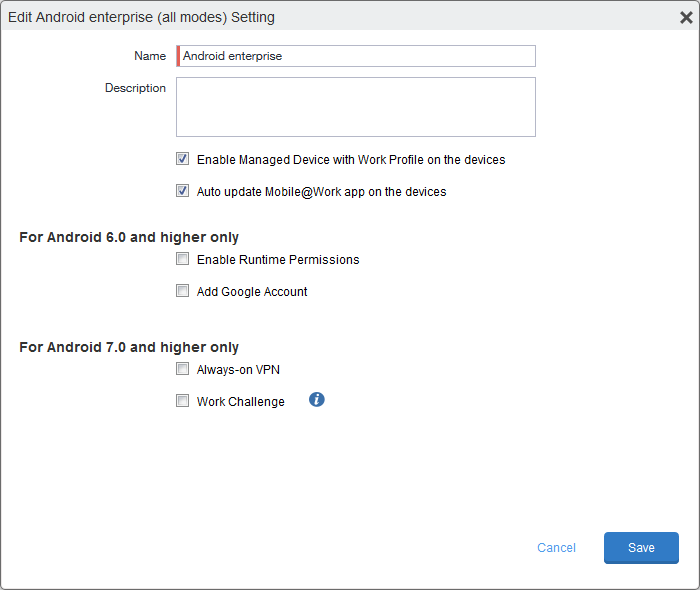 Prior to today, when provisioning an Android Enterprise device an organisation has had two deployment scenarios to choose from: work profile and work-managed. These scenarios, while suitable for a number of applications, offer what is essentially two extremes. Work profile is an approach akin to BYOD management; the organisation has control over a dedicated corporate profile with the capability to enforce basic security on the wider device, but little else. The end-user has full control over the device. Work-managed is the COBO approach to management; the organisation has full control over the entire device, offering no personal use by default. Work-managed also extends to COSU, offering capabilities to further lock the device down to single-use. Arguably that’s either potentially too open or too restrictive for many organisations, and given the default approach to Device Administrator (or legacy) enrolment has been more centred around the COPE model with varying degrees of restrictions, it’s easy to understand why. Up to now the work-around has been to permit the addition of Google accounts within the work-managed environment, however this is a “solution” I’d recommend strongly against as it effectively mixes corporate and personal data, something organisations should absolutely not be considering; given legacy management has had containerisation for a number of years with the likes of MobileIron AppConnect, implementing this would be a giant leap back in terms of security and data isolation. With today’s release that is no longer going to be a concern. After Enable Managed Device with Work Profile on the devices is selected and the configuration is saved, when provisioning an Android Enterprise device to be work-managed using any of the typical provisioning methods (QR, NFC, DPCi, zero-touch) the device will be prompted to create a work profile after enrolling, leaving the parent profile (or device) untouched for later personal account setup. In terms of UX, it’s honestly just a straight-forward mash-up between a work profile and work-managed deployment. The below Sony Xperia XA2 is provisioned with a QR Code (off-screen) with system applications enabled. With the new deployment scenario comes a few recommendations and things to keep in mind. Just as it’s possible to migrate from a legacy Device administrator enrolment to work profile with a simple configuration change on the EMM server, so too is it supported to migrate from work-managed to managed work profile. Unfortunately, MobileIron doesn’t support this with the release of 9.7.0.1, meaning in order to migrate from work-managed the device will need to be factory reset and reprovisioned. If the organisation utilises zero-touch this is a relatively simple process and combined with managed app configs the re-enrolment can be quick and painless. If zero-touch isn’t available just yet, utilising a QR code offers a balance between enabling remote reprovisioning while ensuring the relevant features are available (more below). Furthermore, toggling the Enable Managed Device with Work Profile on the devices checkbox will have no effect on enrolled devices, only those enrolling after the configuration is saved. Did zero-touch catch your attention above? Not quite sure what it is? Check out What is Android zero-touch enrolment? Normally for work-managed deployments, system apps are disabled to remove most of the unnecessary or unwanted bundled apps. As the device is being provisioned for a COPE environment, it makes sense to leave system applications enabled unless there’s good reason not to do so. Disabling system apps will result in a device utilising a minimal number of applications, only enough to ensure the device works, requiring the end-user heads to Google Play in order to get the applications they desire. This could result in additional and unnecessary effort, as well as increased data costs for those primarily utilising data. DPC identifier enrolment (afw#mobileiron.core) does not support enabling system applications and so NFC, QR code or zero-touch provisioning should be used instead. As the devices utilising managed work profile will fall under the work-managed category above, whether a retire or a wipe is sent, the device will initiate a factory reset. All personal data will be lost unless backed up. When end-users complete enrolment, they will be returned to the home screen of the work-managed parent profile. Normally when setting up a new device the end-user will be taken through a wizard offering account addition amongst other things. This will not happen and therefore users will need to manually add a Google account through device settings (some exceptions exist, such as Pixel which offers to continue setup when opening settings). An example of this is provided by my work profiles on fully managed devices provisioning guides. For organisations that have implemented one universal Android Enterprise configuration for all AE-capable devices, it will now make sense to start managing these via more complex labels integrating Active Directory groups, custom attributes or other means of separating the work-managed devices from those that will support managed work profiles. This hasn’t been otherwise required up to now as the two main deployment scenarios are invoked via different provisioning methods. If end-users within the organisation utilise G Suite accounts privately, adding them to the parent profile will result in Google Play becoming managed and limiting application installation to only those approved by the G Suite admin of the user’s private domain. It’s an unlikely scenario, however given private groups and individuals utilise G Suite as well as businesses, it’s possible this may cause a temporary issue (removing the account and adding a non-G Suite account instead will resolve this, but purchases will not be available). Self-hosted private applications allow administrators to privately host APKs with MobileIron, whilst leveraging Google Play for distribution. This will be a welcome addition for organisations not wishing to push their in-house applications into Google Play itself. Admins can simply import the APK file into Core, tick the box to install for Android Enterprise and finish. Once generated, admins will need to download the APK Definition file, extract the license and paste it into the provided area before saving. As simple as that! More information can be found on Google’s help pages here or on my Introduction to managed Google Play over on Brian Madden. It’s now possible to enforce upgrades automatically, set an update window to ensure system updates don’t interfere with BAU activities, or postpone up to 30 days for testing and verification. A welcome addition to make update management just a little easier for the wider Android ecosystem. I believe managed work profiles are possibly the most important deployment scenario Android Enterprise offers for the non-rugged market. Understandably Google chose to first concentrate on the BYOD (work profile) and fully managed (COSU, COBO) deployment scenarios in order to tackle two large market segments, however with 78% of business-use device shipments being Android last year (Source: IDC) and still only ~35% of these devices being under management, there’s a very large market of both new and existing organisations who’ll want to take advantage of work profiles on fully managed devices over the existing option; when I talk to organisations it has often been the type of deployment scenario they’re keen to adopt and, until today, one they haven’t been able to adequately replicate with Android Enterprise. Knowing organisations can migrate from Device Administrator to Android Enterprise managed work profile without sacrificing either organisational control or personal usage is going to have a dramatic impact on Android Enterprise deployments going forward. Ready to get started? Check out the new work profile on fully managed devices provisioning guides over on Android Enterprise provisioning guides and contact your MobileIron solutions provider to learn how you can upgrade to Core 9.7! To learn more about Android Enterprise in general, head over to Android to read all the documentation created to date.